The 25th March was the latest of Chris’s events which recreated a 1940’s theme in the Skittle Alley at the Bulls Head in Whetstone. 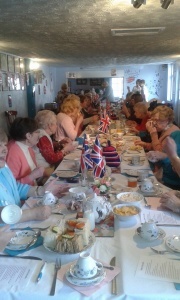 Decorated with bunting and flags posters and other memory joggers our 1940’s style Tea party was a great success. With some 30 plus guests joining us to enjoy their rations. The atmosphere was totally believable. The music was all of the period and a quiz to test the memory was a key point. The rations were as authentic as we could make them recreating the tastes and delights of a time when the food was some what different. It was a great opportunity for old friends to meet and new friendships to be made. Stories of the 40’s were exchanged and memories of a bygone era were alive and being relived. Every one enjoyed their afternoon out and all are looking forward to the next event. As always with these events we are indebted to Chris and her team for their imagination and hard work in preparing and organising the event. Not only do we appreciate the contribution that the funds raised make to running the scheme, but also to the success in another event that involves our service users, Well done to all involved. We now have a Love Blaby Lottery page! Support Whetstone Good Neighbours and other local causes and win prizes of up to £25,000! 50% of all tickets sold from our page go to us! 10% goes to other good causes in Blaby District! Tickets only cost £1 per week! Support us and win prizes – WIN WIN! Alternatively if you do not wish to use either if these methods one of our volunteers is running a syndicate which will enable you to play without having to provide your banking details. If this is of interest to you then contact the scheme on the normal number 07939 685537 and we will arrange for you to join a syndicate. 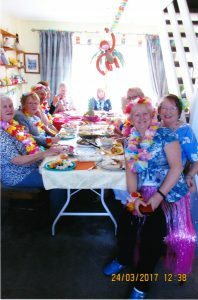 On 24th March 2017 Chris, one of our volunteers, hosted a Hawaiian Lunch as a fundraiser for the scheme. The venue was decorated out with palm trees, flowers everywhere, a blow-up monkey hanging from on high and blow-up flamingo’s, with garlands for the guests and lots more. The table was beautifully set and the food tropical in effect….. scooped out pineapples with sweet and sour exotics, strawberries in chocolate, flowery cupcakes, and tropical cocktails. Guests reported it as amazing, entertaining with excellent food and good company. A great time was clearly had by all. 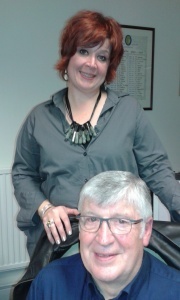 This was a fantastic event all round, raising a significant sum towards the WGNS operational costs. We would like to thank Chris, all her helpers and guests for their generosity which is a major step towards the ongoing funding of the scheme.